That’s the first question out of most people’s mouths when you tell them you workout. I haven’t done a bench press in about five years. It’s actually a very unnatural movement and it puts a lot of stress on the shoulders. 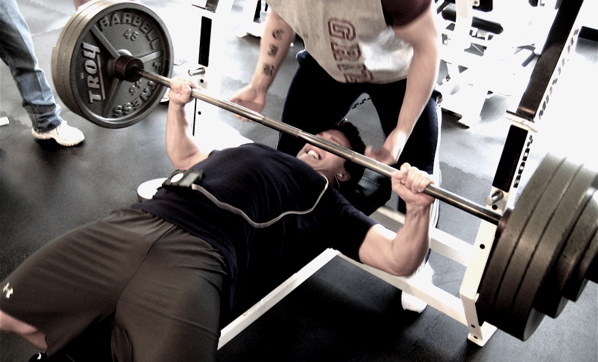 The bench press is seen as a benchmark of how strong you are, and in their quest to increase their bench press people end up turning the exercise into a full body workout, over-using the shoulders, lifting the lower back off bench and thrashing their legs to try and get that last rep with the extra weight. It’s pretty ridiculous and you actually end up using your chest very little. If you really want to test your strength, try the one handed dumbbell press on a resistance ball. This doesn’t allow you to cheat because if you do, you’ll roll right off the ball. You have to keep your core tight and only use your chest if you want to stay on the ball. I recommend using a count of four seconds to lower the dumbbell and one second to raise it. This will take momentum out of play and you will truly be able to test just how strong your chest really is. This is usually an eye opener for most people so make sure to choose a weight that is less than what you usually use until you get comfortable with the balance, the movement and the tempo. Sign up now for the Best Body Bootcamp four-week program. Next Bootcamp starts July 20. Best Body Bootcamp is a goal-oriented, fitness program that I co-founded. Every workout is different and are all based on interval training. Check out bestbodybootcamp.com to sign up now. Image courtesy of Ennui Design.